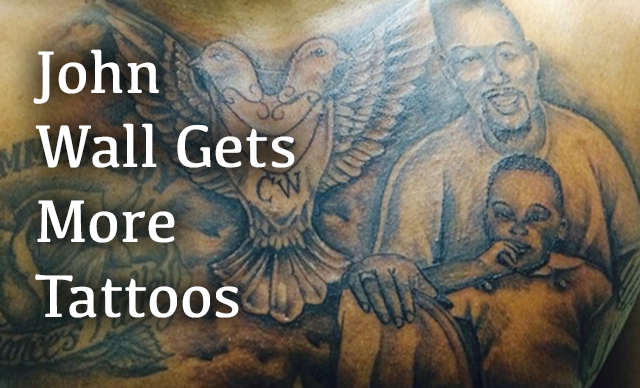 Well John Wall is covering up more of his body with tattoos. He now has his entire front side tatted up after picking up 2 more tattoos this offseason. The two new additions are a picture of him as a kid with his dad (who passed away a long time ago) and a tribute to his two sisters with their initials in a bird. Check out the new ink. Wall already had the Raleigh skyline done on his midsection as well as a big "Mama's Boy" tribute to his mother over his right chest. Now with the 2 new tats on the rest of his chest his entire front side is basically covered. And let's not forget he's got a giant owl taking up his entire ride side, and his enormous "Great Wall" tattoo on his upper back. At first John didn't want to get any tattoos due to marketing reasons, but after getting inked up in 2013, Wall is on a role. I did not contact Jason Reid to ask his opinion this time. Here are some of his other ones, all done by Tattoos By Randy. August 2013 - The Owl..."No Time To Sleep"...because he is working hard and practicing all the time. The Raleigh skyline with area code, highway, etc. Where Wall grew up. And here's his Great Wall Back Tattoo, a massive brick wall that says GREATWALL with no space between the T and the W...from an ESPN the Magazine Body Issue video (via Washington Post).